"Great grilled turkey! My grill is an old one that has a hinged top. I open all of the vents and prop the lid open about 2 to 3 inches with a stick...man does it get hot! Do not spill the juices and wine on the coals, as they are extremely flammable." In a pot style grill, fill the bottom with a 5 pound bag of charcoals. Light the charcoal, and when ready, spread to cover the bottom of grill. Wash the turkey down and stuff with onion. Rub the exterior down with salt and pepper. Place the turkey in a deep aluminum roasting pan. Place the pan on the grill's grate. Pour wine over the turkey. Cover the top of the turkey with foil. Cover the grill with the lid and open the vents. 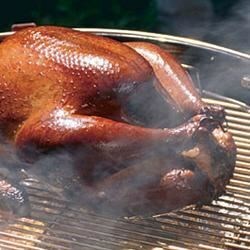 Grill the turkey for 60 to 90 minutes, or until meat is to your liking. Baste frequently. You might need to add water to the pan if the wine evaporates. Fantastic, juicy turkey, quite tender. Delicious!! Love it! This is the kind of recipe you want when your cooking for a large group. You can bake one Turkey while the other is out on the grill. Yum-O! This is the best way to cook turkey!! I used a bottle of sparkling white wine and the gravy was amazing. Love love love this recipe! !